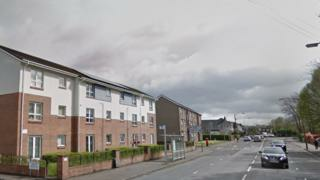 A man has appeared in court charged with attempted murder following a disturbance at flat in Glasgow. Two other people have been charged with assault to severe injury following the incident in the Springburn area. A 39-year-old man is in critical but stable condition after the incident at a flat in Colston Road on Saturday. A 44-year-old man and a 41-year-old woman were also taken to hospital following the disturbance. Michael Thomson, 45, was charged with attempted murder when he appeared at Glasgow Sheriff Court. The Crown Office said he did not enter a plea and was remanded in custody. A 16-year-old boy who also appeared at the court was charged with assault to severe injury. He did not enter a plea and was released on bail. On Tuesday, Mary McEwan, 41, was charged with assault to severe injury when she appeared before Glasgow Sheriff Court. She did not enter a plea and was released on bail.